Monday 19th - 25th June is national Women In Sports week to raise awareness of those playing, delivering, volunteering and watching sport to promote sports for women across the UK. 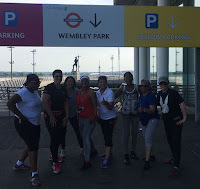 There are various activities in Brent for girls and women, many run on Sundays ( pun intended Fly Girls run every Sunday) such as the various women's football clubs and training for women at Preston Manor School or Vale Farm Sports Centre to name two. As we get into summer it is an ideal time to find activities locally and get out and about. There are also Women Volleyball sessions taking place at Willesden Sports Centre on Sunday afternoons. Mid week there is a women and girls netball club at Kingsbury High School or Saturday's at Ark Academy. Again on Sunday afternoons there are women and girls basketball sessions at Vale Farm Centre. Most of these sessions are low priced and some are free, whereas Our Parks have free fitness and tennis activities to registered members. Hopefully you can find an interactive sporting or fitness activity this week. The Fly Girls Running Community always welcome beginner runners and we are a friendly social group supporting each other back into fitness with occasional fitness social activities, we look forward to meet you on Sunday 25th June. I am myself an athlete and I have been participating in women sports competition wherever I get the chance to promote sports for women across my country.